As thin as this free agent class of the winter of 2016-17 is, collectively, the third base group represents an especially barren group among the positions, something that I covered a couple of weeks ago. Justin Turner is obviously the only true prize of the bunch, but I did also note that Luis Valbuena could be an intriguing option for a number of teams, due to the pop and approach that he brings, as well as his oft-noted versatility. As it would turn out, early suitors are already emerging, with the New York Yankees appearing to be at the front of the line for the 31-year-old infielder. It’s interesting that the Yankees would be after Valbuena as an option, especially given that he’s believed to be pursuing a situation where he has an opportunity to get regular starts, even if those starts don’t come at the hot corner. The Yankees wouldn’t appear to be that opportunity, with Chase Headley and Starlin Castro currently locked into third and second base, respectively. Nonetheless, Valbuena would likely represent an upgrade for the Yankees on their current infield, specifically as things currently stand at third base. The Yankees have tried before to move Headley and it might behoove them to do just that again. Not that moving Headley would represent the easiest of tasks, with two more years remaining on that four-year, $52 million pact he originally signed. But the logistics of such a move aren’t necessarily my own concern or responsibility. Should the Yankees continue their pursuit, the addition of Luis Valbuena would represent a clearly preferable option in that regard. The numbers there largely speak for themselves. Headley leads in WAR by virtue of his defense and a couple of other categories where the fact that he had almost 200 more plate appearances comes through in his favor. As an offensive entity, Valbuena would be a rather significant addition to their lineup and a clear upgrade over Headley. He walks more and the strikeout numbers are extremely similar (more on that in a moment). His on-base skills have always been relatively solid and he brings a fair bit of power to the equation. A team that scored 680 runs last year, which ranked 22nd in baseball, could absolutely use the approach that Valbuena brings. One of the more patient hitters in the game, Valbuena saw 4.35 pitches per plate appearances last year. His ability to look at pitches over the course of an AB has become something his game is predicated around, with 4.11 P/PA for his career. His walk rate is over three points higher, with a strikeout rate that is more due to working deep counts than any potentially alarming flaw in his overall approach. He’s a significant power upgrade, as indicated by an ISO that sat a notch just below .200, 60 points above that of Headley. 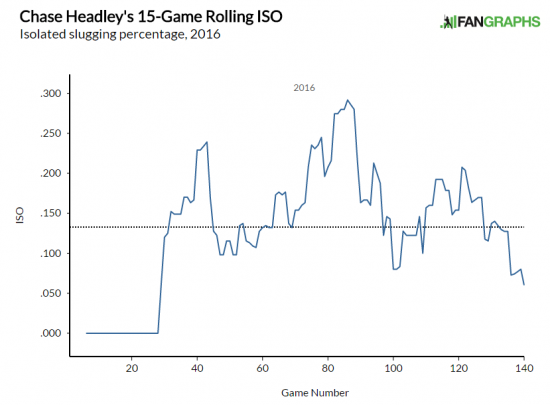 The fluctuation occurs far more frequently for Headley here. His season ended early, but Valbuena was able to piece together a more dangerous offensive approach than Headley, who did rack up those 529 PAs. Save for a brief spell in July, Headley was largely incapable of producing the same type of offensive output on a level with that of Valbuena. 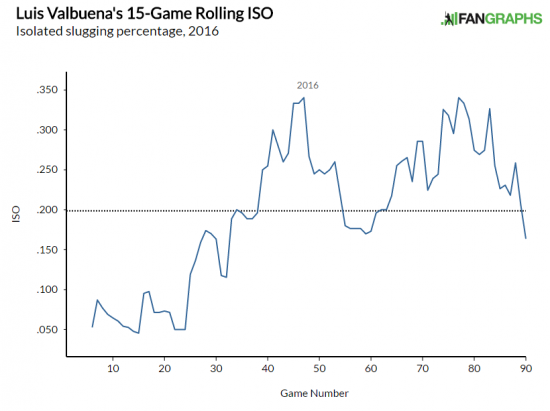 The deeper aspects of each player, in terms of contact trends, would also appear to favor Valbuena. Again, items presented here would appear to favor Valbuena. He makes harder contact on a more regular basis. Combine that with his ability to get the ball in the air and you have a player whose skill set would player rather well in the Bronx, in a simplified sense. Save for a short time in July, the Yankees aren’t attaining the type of production from Chase Headley than they had originally hoped when he locked into that four-year deal. The negative offensive value that he provided, based off of that -1.0 Off rating alone wasn’t the first time he’s done that in a Yankee uniform. He posted a -5.5 mark in 2015, as well. Even in the year that he was acquired, he came through with a figure of only 0.1 between his two clubs. With that in mind, it really isn’t a mystery why the Yankees would be pursuing Valbuena. And if you flip the perspectives, Valbuena should want to pursue an opportunity with the Yankees as well. Playing his home games at Yankee Stadium would represent a wonderful situation for his specific skill set. When you take into account the other aspects of a potential signing, especially the versatility, it really should come as no surprise that the two sides are talking. Should it progress to the point of a signing, it’ll be interesting to see how he’d be deployed. The most obvious choice, given my own hope that there is still offensive upside in Starlin Castro, is that he gets the regular starts at third base. But a player that versatile could be utilized in a number of ways, which the Yankees are obviously aware of, hence the mutual interest. The moral of the story here, though? That Luis Valbuena would represent a rather significant upgrade over the Yankees’ current situation at the hot corner. We hoped you liked reading Luis Valbuena: Future New York Yankee? by Randy Holt!